With highly publicized incidences of data loss and increasing security risks, many organizations struggle to develop and maintain a strong information technology (IT) control environment to mitigate IT risks. Employing qualified IT professionals has also become more difficult due to the high cost of training, limited availability of qualified resources and escalating compensation requirements. 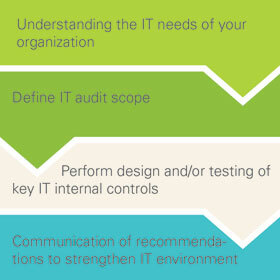 The role of IT audit has never been more important. In order to effectively manage the IT risk universe, your IT audit function needs to be skilled, trained and up-to-date with the ever evolving IT field. In addition your IT audit function should be well versed on a large variety of IT compliance issues, new and evolving regulations and IT best practices that provide value to your organization. Schneider Downs can assist your organization by providing skilled IT audit professionals to meet your IT audit and risk needs. We can work with you to augment your current IT audit staff, or we can operate as a fully outsourced IT audit function. Either way, we will ensure that we provide IT audits that address the most critical risks to your organization. Schneider Downs’ dedicated IT audit professionals have experience working with a wide variety of industries of all sizes. We will partner with you to provide comprehensive IT audits to manage and mitigate IT risks within your enterprise IT environment. We provide a wide range of services that can be tailored to organization’s risk appetite and compliance requirements. With a large number of skilled and seasoned IT Auditors on-staff, we are able to tailor IT audit plans and deliver results that are designed to mitigate the most critical risks to your organization. Our staff also delivers the utmost integrity, objectivity, confidentiality, and independence required by the auditing standards.